What’s the best wine with hamburgers? With chocolate? And what does tannic mean, anyway? 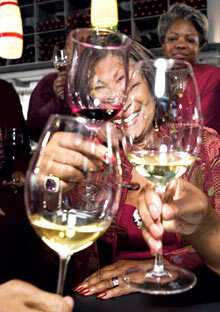 Julie Powell raises a glass to a vintage organization that celebrates wine, women, and friendship. They had hosted dinner for 150 people the evening before, then stayed up half the night making nametags and centerpieces for today’s luncheon, but the Divas Uncorked look amazingly serene as they greet their guests. Rosalind Johnson approaches me with a charming smile, a glass of Roselle Syrah Rosé, and a friendly exhortation: “Breathe!” she says. “You’re here now.” Though I’m frazzled from a long and noisy train ride to Boston, right away I begin to relax. The event at which I have just arrived—a weekend conference featuring multiple-course meals with wine pairings, plus lectures, presentations, and a reception—is called “Wine, Women, and….” It is the highlight of the Divas’ year, and the culmination of nearly a decade of learning, planning, organizing, and sipping. Divas Uncorked started in 1998 when a group of friends decided to learn more about what they were drinking. 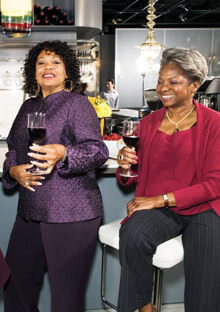 Now it’s a thriving business dedicated to educating consumers about wine, and educating winemakers about consumers—particularly women and African-Americans, who are often overlooked by the industry. To that end, the Divas organize frequent Divas Dine events in restaurants across the country, inviting the public to eat and drink while learning about wine. They act as marketing consultants to wineries and wine stores that become members of the Divas Uncorked Collaborative Consortium. They also manage a Web site, divasuncorked.com. They even have their own wine, Divas Uncorked Chardonnay, produced in partnership with the Mendocino Wine Company. All of this could be quite enough to occupy the friends, ten energetic women in their late 40s, 50s, and early 60s. But each of them also has a high-powered day job, ranging from executive consultant to educator. “We had no idea what we were getting ourselves into when we started,” says Callie Crossley, a commentator with NPR and WGBH-TV, as she walks with me to our seats at the luncheon. As we dig into our appetizers, the conversation in the room grows raucous. Although I don’t know any of the hundred women gathered here, I feel as at ease as if I were sitting around with friends at a girls-only cocktail hour. And I realize the Divas have succeeded in doing what many of us fantasize about: They’ve built a business out of their favorite pastime. Before they were Divas, the women were friends who met doing volunteer work with a nonprofit organization, the National Coalition of 100 Black Women. They started going out together after meetings. “We were always eating and drinking,” says Carolyn Golden Hebsgaard, executive director of the Boston Lawyers Group and the Lawyers Collaborative for Diversity. “Frankly, we were spending a fair amount of money, and we decided we should know more about this wine thing.” They quickly got organized, as type A personalities will, and began hosting monthly wine-tasting get-togethers. At first they served cheese, crackers, fruit, and “little nibbles,” but before long they were planning elaborate, themed dinners. “We were just having fun,” says Karen Holmes Ward, a producer at WCVB-TV. And learning a lot. Stephanie Browne, an information technology director at Blue Cross and Blue Shield and president of the Divas, learned not to serve her reds too warm or her whites too cold, for example. The friends have become educated in more arcane subjects as well, such as vintages and sugar-to-acid ratios. But “wine savvy not wine snobby” is their mantra, and the most important lesson they pass along to consumers is to trust themselves when it comes to taste. “Pick wines that please your palate,” says Ward. As the conference winds down, I ask the Divas how they balance work and friendship. “The one thing we’re not going to lose is what brought us together,” insists Hebsgaard. So on top of all their other responsibilities, they still plan monthly wine-tasting dinners, just for themselves. No wonder, then, that where others might describe a wine in terms of its nose or finish, Browne compares it to something closer to her heart. “My aha moment was when I realized how a balanced wine tastes,” she says. “The fruit and acid and alcohol are all in perfect harmony. It’s like having your favorite food next to your favorite person in your favorite place.” In other words, delicious. Julie Powell is the author of Julie & Julia: My Year of Cooking Dangerously (Back Bay Books). The Wine Divas solve 7 great mysteries of the wine world! Grape connoisseurs, the wine Divas, educate us on wine bottling, serving, tasting and all around etiquette. O: How do you figure out what you like? Divas: Taste as much as possible. Find a shop with helpful salespeople. Many stores are now organized by flavor instead of region or type of grape, making it easier to find winners based on your “flavor profile,” or the characteristics you enjoy. Another good way to start is to select a region—say, California or New Zealand—and then ask your salesperson to recommend five or six typical, affordable wines from there. As you try them at home, jot down notes about color, smell, and taste. There are no wrong answers: You’re learning what tastes good to you, not trying to impress others. O: What’s the ideal serving temperature for wine? Divas: The lighter the body and color of the wine, the cooler it should be. But avoid extremes: Excessive chilling can mask the flavor of a white; too much warmth heightens the alcohol fumes of a red. A rule of thumb is to take whites out of the fridge 15 to 20 minutes before drinking. Reds should go into the refrigerator for about 20 minutes before opening. O: Does the glass matter? Divas: Look for one with a long stem so the warmth of your hand won’t heat the wine. The vessel should be clear and unfaceted so you can see the color and clarity of the liquid. Many experts insist on different glasses for reds and whites, but if you have a limited budget, make sure your glass has a bowl roomy enough to swirl the wine and release its aroma, and a rim that tilts inward so the aroma is channeled toward your nose. Ikea sells a great line of glasses that meet these requirements. O: Are screw tops or wines-in-a-box any good? Divas: Yes to both. Once associated with cheap vino, screw caps are becoming increasingly popular for wines of all prices. The tops are simple to open and close wherever you are—think picnics—and allow you to easily save an unfinished bottle. Boxed wines also once had a bad reputation, but today’s options are often good quality. Try Delicato’s Bota Box Merlot or Shiraz. O: Does the vintage matter? Divas: Not necessarily. The climates of wine-growing regions like California, South Africa, and Australia don’t fluctuate enough from year to year to matter. In Europe, where the climate does vary, the best vintages can be quite expensive; top bottles are collected by aficionados and aged for many years. Lesser vintages are often fine for immediate drinking, however. O: How do you store wine at home? Divas: Many fancy cabinetmakers feature built-in wine racks above the refrigerator, but these are pointless—rising heat can ruin the wine. If you can’t afford a cellar or wine refrigerator, find a cool, dark space with a consistent temperature. Try underneath basement stairs or on a closet floor. If you’re going to drink the wines fairly quickly, countertop racks are fine so long as they’re not in direct sunlight or near a heat source, like the oven. O: How do you overcome being intimidated by restaurant wine lists? Divas: Easy. Don’t read them. When a multipage wine list hits your table, ignore it. After you’ve decided what to eat, ask the waiter what goes well with your food. Either he’ll be able to make suggestions, or he’ll send over a sommelier to advise you. Eating at places that serve a good selection of wines by the glass will also allow you to experiment without investing in a full bottle.